I asked my aunt about my mother’s strange aversion to grits. I wanted to know if it was something that my mother had inherited from my grandmother, or whether it was her very own personal (baffling) quirk. My aunt confirmed that it’s an idiosyncrasy entirely personal to my mother; and that in fact my aunt makes a mean shrimp and grits. She did add that despite living in Virginia that it wasn’t something they grew up eating much because in the South it’s traditionally a breakfast food and breakfast wasn’t something my grandmother typically spent much time preparing. This might explain why I don’t ever remember eating grits when we would visit my grandmother in the summer. Breakfast treats that I remember from summers at Mimi’s were Crispix (don’t ask – my mother had some vendetta against Crispix and wouldn’t buy them at home), Entenmann’s raspberry strudel, tiny powdered Krispy Kreme donuts sold by the bagful and to which my mother was addicted, toasted cinnamon raisin bread dripping with melted butter, and slices of perfectly ripe cantaloupe (to be fair, we also ate cantaloupe for lunch and dinner and for snack in between meals because there’s basically nothing better than farm stand cantaloupe in the South). My grandmother’s apparent disinterest in traditional Southern breakfast foods might also explain why I did not grow up eating biscuits and gravy. Biscuits themselves were a staple of my childhood, both during Virginia summers and at home the rest of the year. But, biscuits were always an accompaniment to dinner. If there were leftovers we’d toast them with butter for breakfast or lunch, but except on Christmas morning we didn’t make biscuits for breakfast. To be fair, my mother adheres to my grandmother’s breakfast ethic and doesn’t tend to do big sit-down breakfasts even when there are guests in the house (that’s what croissants and bakeries are for). I’m not sure if my grandmother didn’t like breakfast, or whether years of working (she was a registered nurse and went back to work when my mother and my aunt were old enough to look after themselves, and continued to work until the hospital reluctantly had to point out that she was at retirement age and then some) meant that breakfast was one meal she could outsource to the grocery store (i.e. cereal) without guilt. 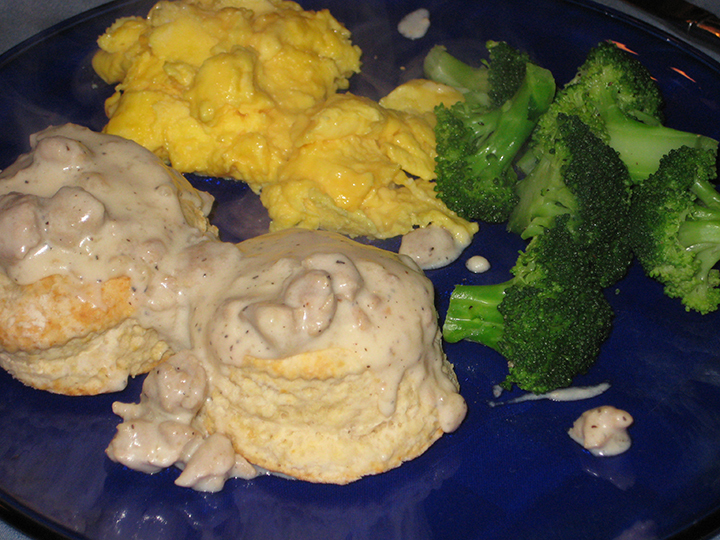 Either way, I never had biscuits and gravy until I was an adult. And this is a shame, because biscuits and gravy are awesome – what is not to enjoy about fluffy golden buttermilk biscuits slathered with butter, and then drowned in rich creamy gravy studded with nuggets of savory sausage? Unless, of course, you take that same golden buttery biscuit and drown it in warm maple syrup. While I am perfectly happy to go out to breakfast – or even better, brunch – the prospect of making that much food first thing in the morning is exhausting to even think about. However, breakfast for dinner is one of my favorite concepts, and for the first Birthday Dinner of the year we indulged in the ultimate breakfast for dinner, followed by a girl scout cookie in cake form. Remove the sausage from the casings (if you’re lucky you can buy bulk breakfast sausage and skip this step). Brown the sausage in the butter a heavy large pan until cooked through, breaking it up with a spoon. Sprinkle the flour over the sausage and rendered fat in the pan (if you’re using pork sausage there should be plenty of fat for you to work with; if you’re using chicken sausage you may need to add some butter or oil to the pan). 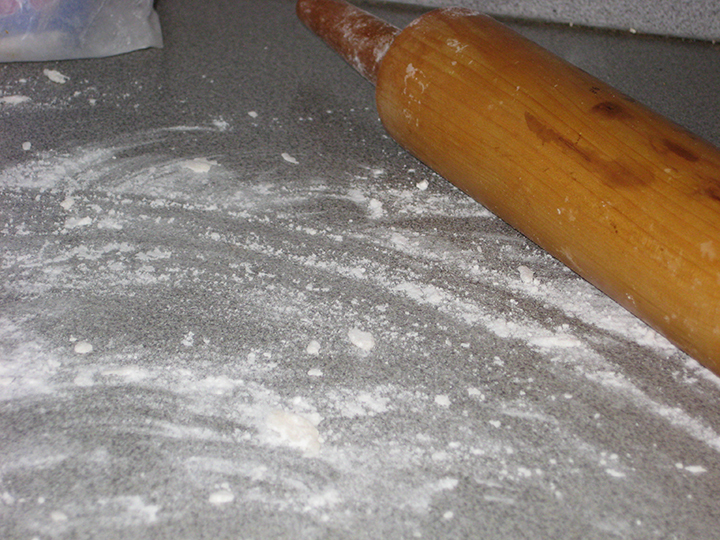 Cook the flour until it is lightly browned. 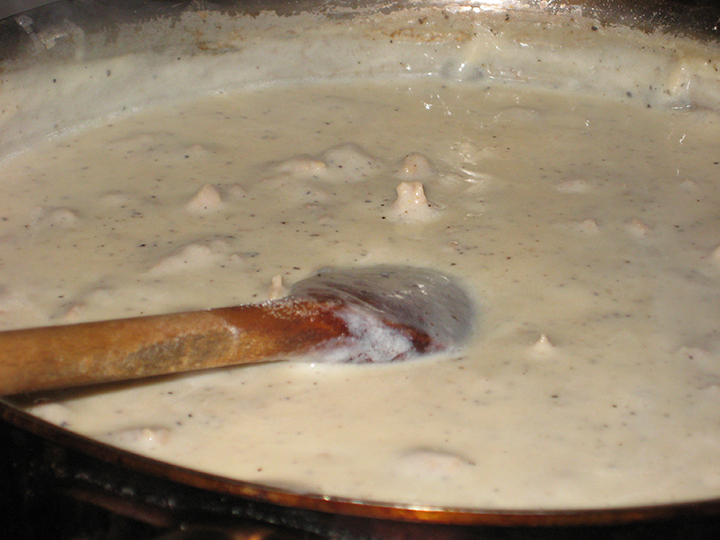 Slowly stir/whisk in the milk, and cook – stirring constantly – until the gravy thickens (anywhere from 10-15 minutes). Season to taste with salt and lots of pepper. Serve immediately. 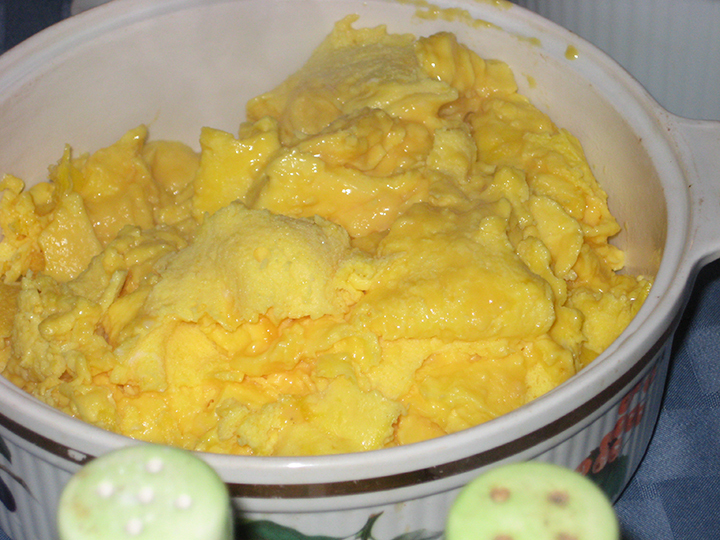 Do people need a recipe for scrambled eggs? I whisk mine with some milk before I cook them, but that’s about it. I like to let them slowly heat up in a pan over a low heat and then raise the heat to very hot at the end and scramble them to loose curds – take them off the stove before they look entirely cooked, or they’ll be a dry rubbery mass before you can serve them. Huh, I guess I just gave a recipe for scrambled eggs. If I’m making eggs for dinner and they’re my only protein then I figure on 2 eggs/person; in this instance where we were having biscuits & gravy (and then cake for dessert) I went with 1.5 eggs/person and then added an extra serving for the pot (so 8 people at Dinner = 12 eggs + 2 eggs = 14 eggs total). If you look at this recipe (originally titled Coconut Cake with Chocolate Chunks & Coconut Drizzle) and think “Mounds Bar!” skip the dulce de leche drizzle and extra hot fudge sauce as garnishes. If you look at this recipe and think “Samoa Cookies! *” definitely add the extra garnishes. * I think at some point it was decided that Samoa Cookies were not politically correct and they were renamed Caramel deLites. I don’t object to the move towards cultural sensitivity; I do object to the grammatical insanity of deLites. Particularly since I doubt that Caramel deLites are lite at all. Anyway. Generously butter an 8” square pan (or 9” round pan), and then line it with a parchment sling and butter that too. Sift together the dry ingredients, and then stir in unsweetened shredded coconut and set aside. Using electric mixer, beat sugar, butter, and orange peel in large bowl until light and fluffy. Add eggs 1 at a time, beating well after each addition. Beat in vanilla. Add flour mixture in 3 additions alternately with coconut milk in 2 additions, beating just until blended after each addition. Fold in half of bittersweet chocolate pieces. Spread batter evenly in prepared cake pan. 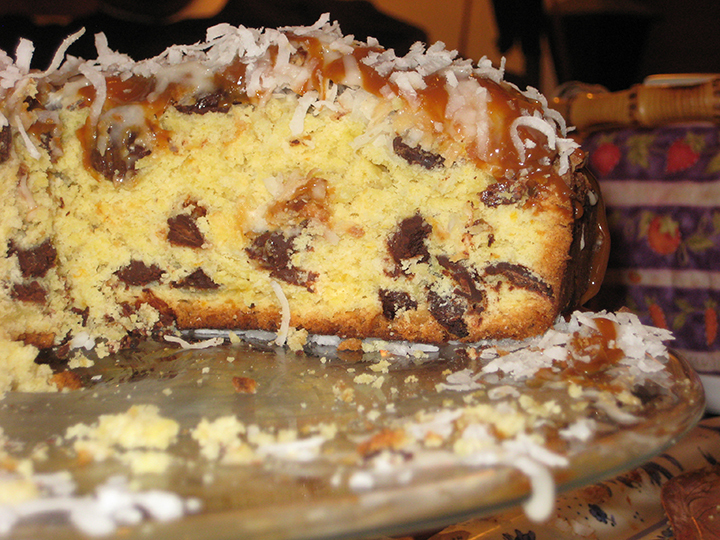 Sprinkle remaining chocolate pieces over batter, then sprinkle with sweetened flaked coconut. Bake cake until golden and tester inserted into center comes out clean – anywhere from 40-60 minutes – tent the cake with foil after about 20 minutes to prevent the coconut from burning. Transfer cake to rack and cool in pan 45 minutes. Use the parchment sling to remove the cake from the pan and allow to cool completely. Cake can be made the day before, wrapped tightly, and stored at room temperature. 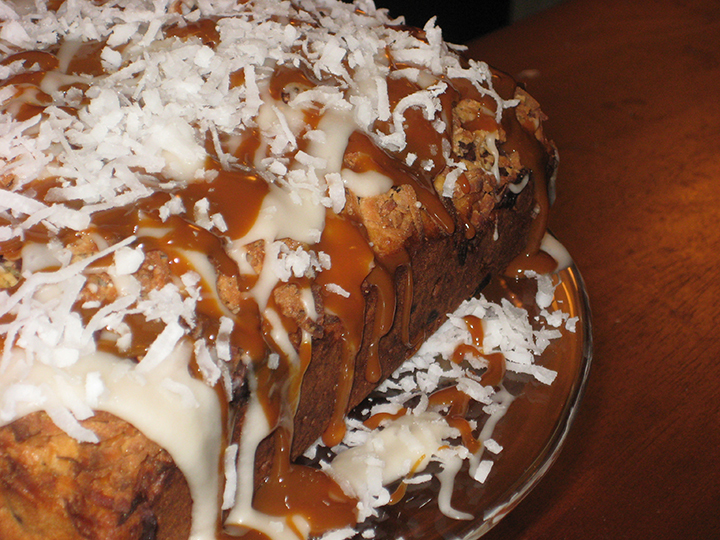 Before serving, drizzle with coconut drizzle and dulce de leche. Serve with vanilla ice cream and hot fudge sauce (optional, but why wouldn’t you?). Whisk powdered sugar, 2 Tbsp unsweetened coconut milk, and vanilla in small bowl to blend well, adding more coconut milk by ½ teaspoons until mixture is thin enough to drizzle over cake. Using small spoon, drizzle powdered sugar mixture decoratively over cake. Cool cake completely on platter.